If you’ve decided to teach English in China, you may be overwhelmed by the sheer number of English teaching jobs available. In Shenzhen, maybe one of the biggest city you’ve never heard of, jobs for expat ESL teachers abound. It’s Vibrant, fast-growing, and young. It’s a haven for tech startups and young people, and it has no shortage of nightlife and fun activities. But does living and teaching English in Shenzhen, China, sound right for YOU? Read on to find out about Shenzhen’s culture, job market, landscape, and more! Teaching English in Shenzhen: Is It For You? Accommodation in Shenzhen: Which Area is Right for You? Teaching English in Shenzhen: That’s a Wrap! Before we go further into what makes Shenzhen unique as a city, we’ll briefly discuss what it takes to teach English in China in general. Teaching English in China may seem daunting, but it’s easier than you might think. I would highly recommend that anyone who has the credentials at least consider being an English teacher in China. It’s a totally singular job, and besides giving you the chance to live in one of the most dynamic countries in the world, it actually pays pretty well. Please read this comprehensive guide on teaching English in China if you want to learn more about the requirements. If you’ve already decided to teach English in China, you may be debating which city is best. Beijing, as the capital of China, has lots of history and culture, but it also is sprawling and has worse pollution than some other places in China. Shanghai has a lot of culture and is full of expats, so you’ll never be lonely or bored. However, that can also mean that the job market is super-saturated, meaning you’re more likely to get a job somewhere far in the suburbs or end up paying an arm and a leg for rent in the city center. Likewise, it can be harder to get an ‘authentic’ Chinese experience when you’re surrounded by foreigners all the time. Smaller tier-two cities like Chengdu, Xiamen, and Ningbo can be more relaxing than the big cities, and you may have more access to local culture and nature in a smaller place. However, you’ll probably have fewer options for public transportation, and it may be harder for you to integrate in a place with less nightlife and fewer expats. No matter where you end up going in China, you’ll have a great time, but it’s important to consider what kind of experience you’re looking for when choosing a city as it will affect the nature of your time there. When I was considering which city in China I’d like to go to, I researched a number of places online and talked to friends who’d gone to China in the past. I also looked at which cities had good job opportunities with competitive pay rates. Everyone told me that Shenzhen was clean, convenient, and affordable, and they weren’t wrong. Additionally, there were lots of Shenzhen jobs for expats, so I felt comfortable going to a city with lots of opportunities. While not every aspect of Shenzhen was a dream, the city far exceeded my expectations, and I’m so happy I ended up teaching English in Shenzhen. Just 30 years ago, Shenzhen was a tiny fishing village, but then the Chinese government turned it into a Special Economic Zone and began pumping money into it, turning it into the fastest-growing city in China. Today, it’s a city of over 10 million people, up from only 30,000 just decades ago. Because of its unique history, its infrastructure is cleaner and more intentional than that of cities that have grown over long periods. It features perhaps the best metro I’ve ever seen: clean, efficient, comprehensive, and very fast. It also has lots of parks and green space, providing respite from the bustle of city life. Due to its newness as a city, Shenzhen does lack some of the culture and history that make Shanghai and Beijing so fascinating. However, the influx of young people means that new restaurants, bars, galleries, and more are opening every day. Shenzhen’s location is also convenient because the city is situated close to the sea and to Wutong Mountain, meaning that the beach or the mountains are only a short drive away. The city is also only about 45 minutes away from Guangzhou on the bullet train. So if you’re every bored of Shenzhen’s many options, a mini vacation is at your fingertips. Shenzhen is also close to a number of other big cities. Hong Kong, Guangzhou, and Macau are all within an hour or two of Shenzhen, meaning you can get a change of scenery whenever you want. One of the biggest advantages of teaching in Shenzhen is how many job opportunities there are there. As a TEFL-certified native speaker, you’ll find yourself with no shortage of exciting, competitive offers for jobs teaching English in Shenzhen. You can find English teaching jobs in WeChat groups and on online forums. One of my favorite parts about Shenzhen was that even though it was a cultural capital it was imminently affordable. The median rent for a 1-bedroom in Shenzhen is ¥4715 ($686) a month in the city center, and ¥2900 ($421) outside of it, according to Numbeo. I paid ¥3000 ($438) a month for a room in a 2-bedroom apartment in the city center when I was teaching in Shenzhen. The average salary for a foreigner teaching English in Shenzhen is listed at around ¥13-16K (or $1890-$2473) per month on Glassdoor, which falls about in line with my experience in Shenzhen. In a city as big as Shenzhen, you’ll be able to pay as much or as little for most items as you want. However, transportation, housing, and basic amenities are incredibly affordable. Mobike, Ofo, and similar bike share programs make it easy to cruise around Shenzhen for convenience or for fun. Simply swipe a QR code with your phone, pay a nominal amount (usually around ¥1 or 25 cents), and you’re free to bike all around the city without worrying about where you park your bike or how long you ride for. Taxis and Didis (Chinese Uber) are cheap and abundant in Shenzhen, and the city also has an extensive and user-friendly bus system in the event you find yourself trying to go somewhere outside of the metro’s reach. Last, the vast number of Shenzhen English teaching jobs means that you can find work in any part of the city you want, so you can live and work in the neighborhood best suited to you. Shenzhen is comprised of nine districts, each of which has its own flavor and character. Think of it like New York’s five boroughs, but bigger and more Chinese. When you’re deciding which Shenzhen English teaching jobs are right for you, take into account which part of the city you think you’d be happiest living in. If you want to live around other expats and are looking for excitement and convenience, consider living in Nanshan. Home to Sea World and Shenzhen Bay, you’ll find live music, food, and events galore in Shekou. However, it is a little bit more expensive than some other areas in Shenzhen. For a little more history and Chinese character (and a relatively lower price point), Luohu is the place to go. The oldest district in Shenzhen, Luohu contains Dongmen Pedestrian Street, where you can find everything from dirt-cheap knockoff designer goods to crunchy crickets on sticks. In Luohu, new meets old and big meets small. Shenzhen’s true city center is located in Futian, which is home to most of the city’s biggest businesses and also hosts Shenzhen’s main bar and restaurant area. Futian is a great place to live because it has lots to do in its own right and is also located centrally, making it easy to get from there to other areas of the city. Each district of Shenzhen has its own flavor, and its own pros and cons. 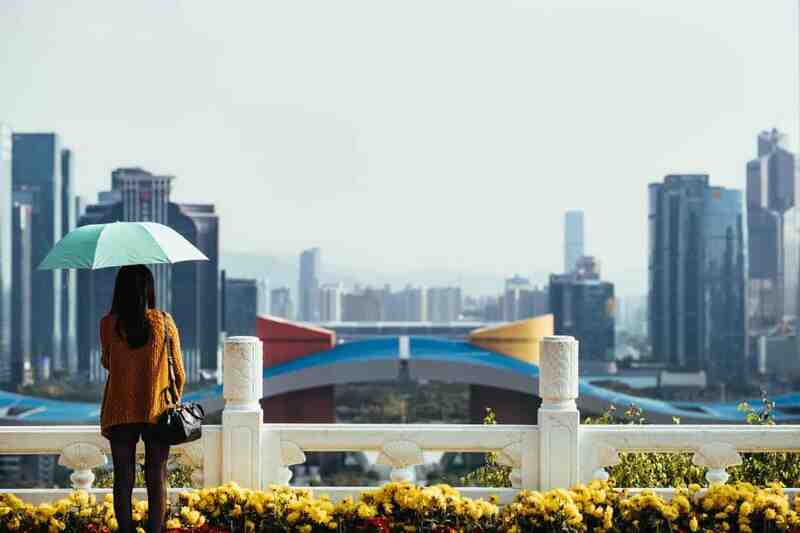 For more information about what residing in each area of Shenzhen is like, you can talk to people who have lived there or look online for resources like this guide: “The Best Places for Expatriates to Live in Shenzhen”. If you choose to work at a public school they’ll most likely provide you with accommodation on campus, but if you end up at a private school or training center you may have to find your own apartment. Finding your own apartment is more work than living at school, but it also gives you more independence and more choice about where you want to live. Your school will probably put you in touch with housing agents, WeChat groups, or other forums to help you find housing if they don’t provide it for you. Some people opt for shared housing with other expats or Chinese roommates, while others choose to live alone. The conditions of your housing will, of course, depend on where in the city you end up living. Whatever it is that you like to do for fun, you’ll find it in Shenzhen. I had friends who joined the ultimate Frisbee, soccer, and rugby leagues in the city. You’ll also find open mics, improv, trivia nights, concerts, and more in this burgeoning metropolis. I took yoga and HIIT classes in Shenzhen, and I had friends who danced, draw, and learned calligraphy there. I also took Chinese tutoring and availed myself of occasional free classes. I even joined a hiking club! Additionally, I found delicious restaurants serving both Western and Chinese food, and bars and clubs playing all varieties of music. You can find all kinds of food in Shenzhen, but make sure to try some local specialties while you’re there. Because Shenzhen is on the water, seafood abounds there. You can chase fresh oysters and lobster with giant beers at one of the many casual restaurants you’ll find lining any given street, or you can pick up shrimp in the shell at a street cart. Or you can spring for my personal favorite, a whole fish served in spicy flavored oil along with your choice of vegetables. Because Shenzhen is located in the heart of Canton, or Guangdong, it’s also known for some regional specialties. Shenzhen is known for its flavorful and healthy rice congee cooked with seafood, chicken, or other additions. And for brunch in Shenzhen, nothing beats dim sum. Gather a group of friends and choose a number of small plates such as barbecue pork bready dumplings, dough sticks, turnip cakes (they’re tastier than they sound! ), sweet red bean dumplings, and more. China’s answer to tapas, dim sum will leave you satisfied the whole day. Located in the Pearl River Delta, Shenzhen has a tropical climate, which means palm trees and not a chance of snow. It can get pretty hot in the summer, but the subway and most indoor places are air-conditioned. If you love cuddling up with hot chocolate in front of the fire on a snowy day more than laying out at the beach, however, Shenzhen may not be the right city in China for you. Because Shenzhen is seaside, it is affected by typhoons. Each spring brings rain and the chance of typhoons. You may get a few typhoon days each year (think snow days but super windy), but storms usually break far before they hit the city, so if you stay safe you have nothing to worry about. There are lots of beautiful waterfront parks and trails in Shenzhen, so you’ll have ample opportunity to soak up the beautiful weather there. Opportunities for teaching English in Shenzhen are abundant, but that doesn’t mean that everyone will be happiest living there. However, in my time there I found that the people were nice, the weather was fantastic, and the food was amazing. I couldn’t recommend Shenzhen enough to anyone looking for a convenient, vibrant city with clean air and an energetic vibe. If you have more questions or are considering going to Shenzhen, I encourage you to look it up online or reach out to me directly!